Homeowners have new reason to rejoice; while the past several years have been difficult, housing prices are beginning to go back up. While the gains aren’t great, the trend is definitely moving upward, which means that the future for the real estate market is looking a bit brighter than it once was. There are a few outliers in the data, including foreclosures; if these are removed, the gains are even larger. Furthermore, experts have predicted that the numbers will continue to rise, although the real estate market is notoriously unpredictable. 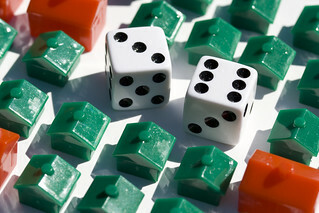 If the American economy is negatively affected by a series of foreclosures or is impacted by situations in other countries, the outlook may start to look much grimmer quite quickly. Still, there is no denying that things are looking up. While on the surface this appears to be good news, there are a few things to keep in mind. Whenever home prices go up, there are fewer options on the market. As a result, the prices rise even more; homeowners are able to ask more for their properties because there aren’t as many options, and buyers feel a greater sense of urgency to quickly bid on the home that they want. This can potentially lead to a situation where two or more buyers are trying for the same property, driving up the selling price. This is all compounded by the fact that many sellers will keep their houses off the market as all this occurs, shrinking inventory even more, as they wait for prices to continue to go up. Furthermore, once higher prices have been in effect for a while, the number of houses on the market should slowly rise. Eventually, people will want to sell and make a profit, particularly those who once owed more money on their mortgage than their home was worth. Furthermore, when the prices are high, developers will begin to build more houses. This process has stalled in recent years, and there are far less people employed in the construction industry than there has been in the last 60 years. If real estate prices continue to go up, more jobs will be created. Still, it is important to remember that when prices go up, fewer people are able to buy homes. For the past several years, it has truly been a buyer’s market in real estate; in most cases, it has been more financially feasible to own a home rather than rent on. Rising prices will change all that, and they will also make it more difficult for people to rent as well. One potential solution is for local governments in large cities to relax their rules when it comes to how much or what type of new construction can be built. Finally, as home prices go up, people begin to feel better about the real estate market. While this may seem to be a good thing, too much excitement could mean trouble for homeowners. There is no guarantee that prices will rise to their former levels. If people purchase a home that they think will be eventually worth more, they could end up paying too much for it, leading to trouble down the road. To prevent some of these things from happening, it is crucial that our society does not build homes that are too expensive for the local area orpush families to buy homes that are too expensive for them. The reality is that we should soon see some changes in the real estate market; it is important to be prepared for both the good and the bad. Jim Flick is a real estate agent for rockville centre apartments.